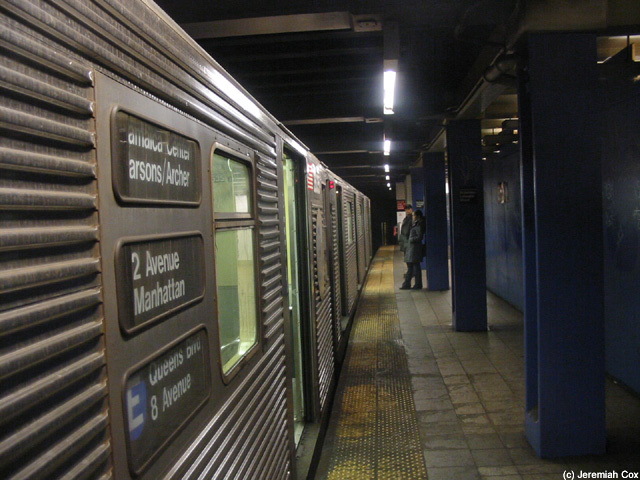 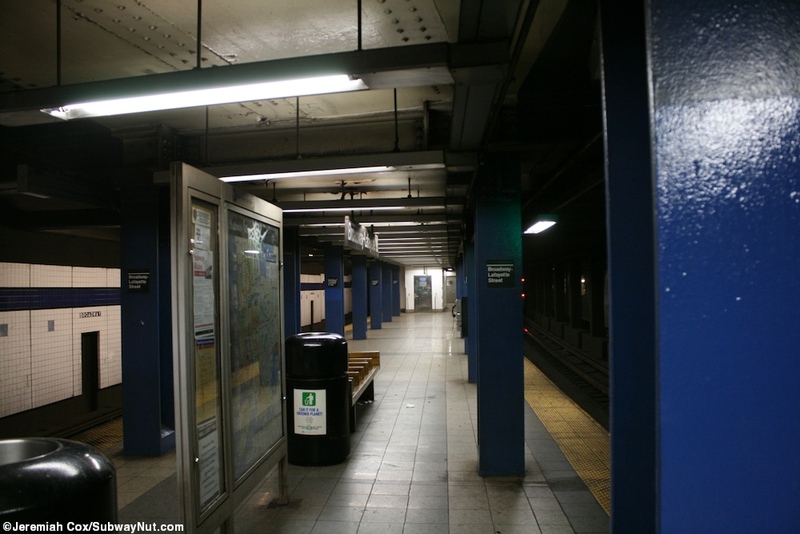 The Broadway-Lafayette St Station is a deep IND express station. 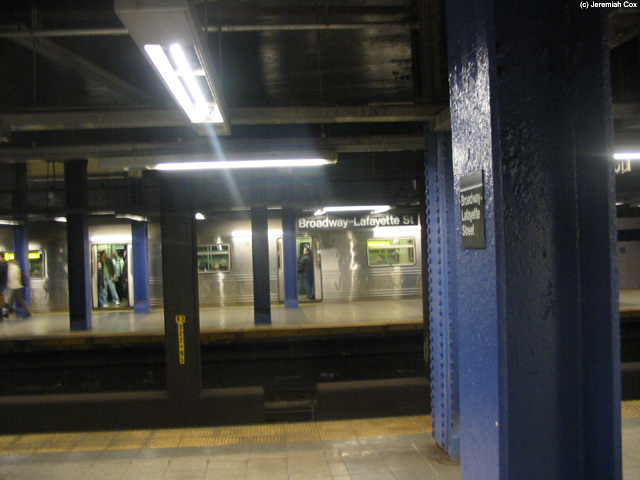 The stop has two island platforms for the four track line. 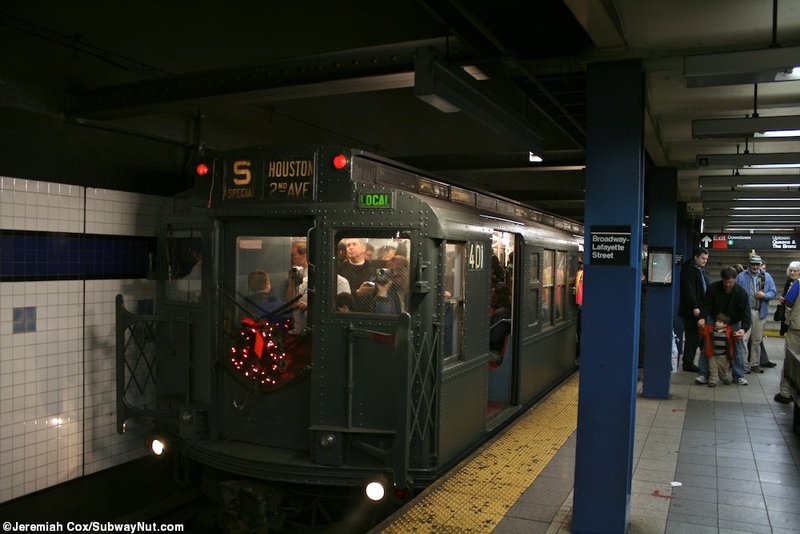 The color scheme is dark blue with a blue trim line and black boarder with the tiled station name beneath the trim simply saying Broadway, not Lafayette. 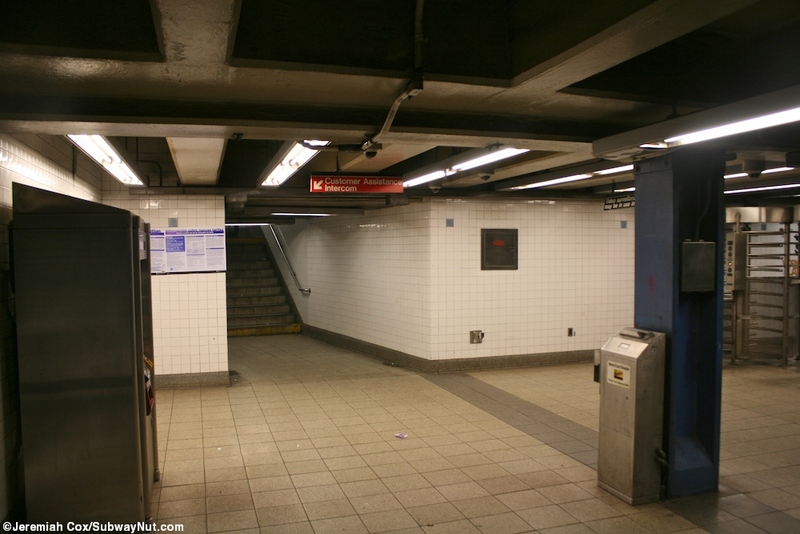 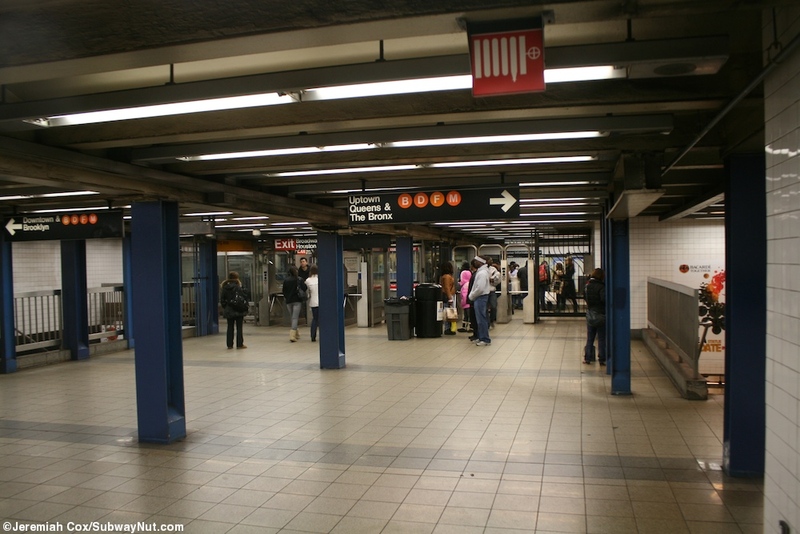 The stop was renovated in the late 1990s and is currently under construction again which will change subway riders riding patterns because a connection to uptown 6 trains instead of just only downtown ones will be built. 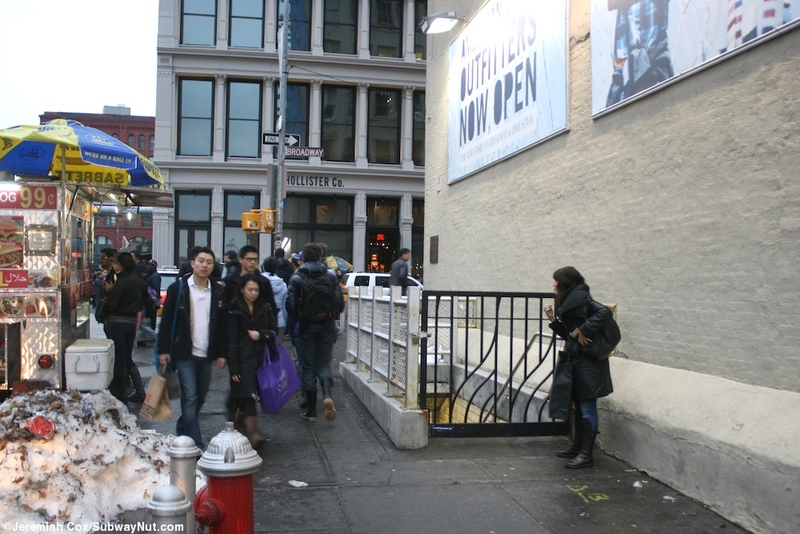 The evidence right now is some blue plywood and some construction areas at street level since digging has been needed. 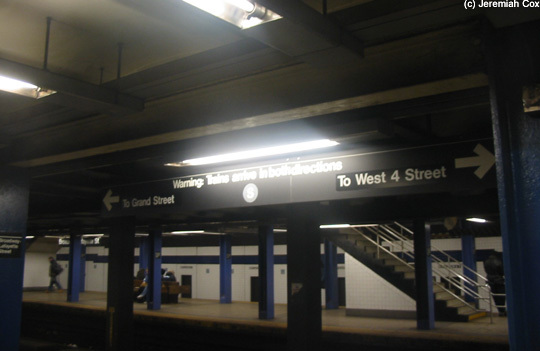 The present layout consists of the main full time booth entrance at the intersection of Broadway and Houston Street. 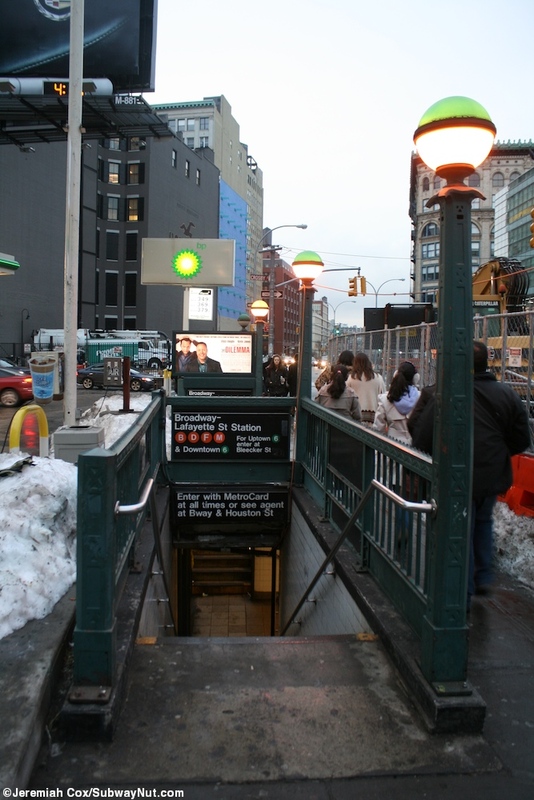 There are two street stairs to the NE and SE corners. 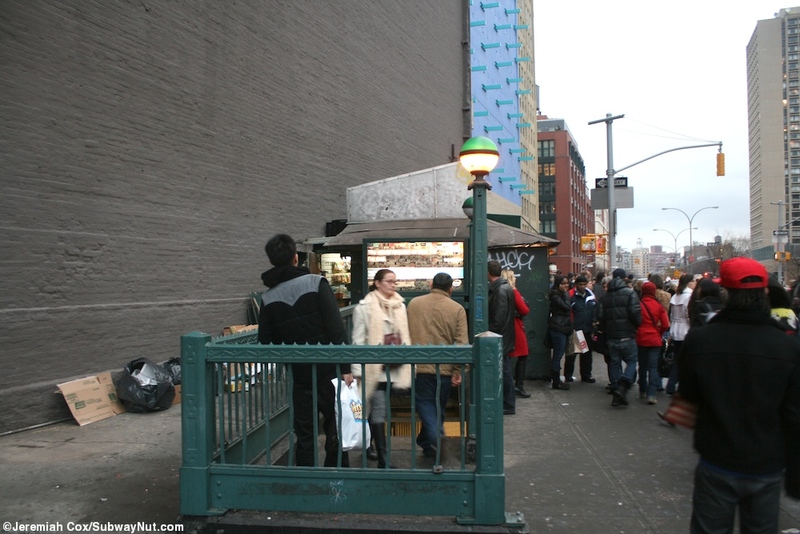 An odd looking street stair down to a locked gate but with IND tiling is at the SW corner along the sidewalk of Houston Street is evidence that there was once an additional entrance there. 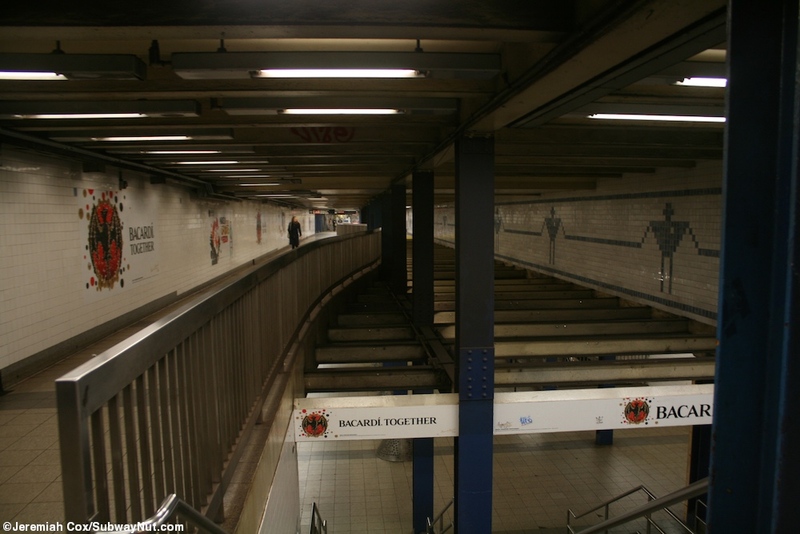 The turnstiles lead down to the upper mezzanine level (the station is so deep that there are two mezzanine levels) where a staircase leads directly down to each of the platforms and a wider staircase leads down to the lower mezzanine level. 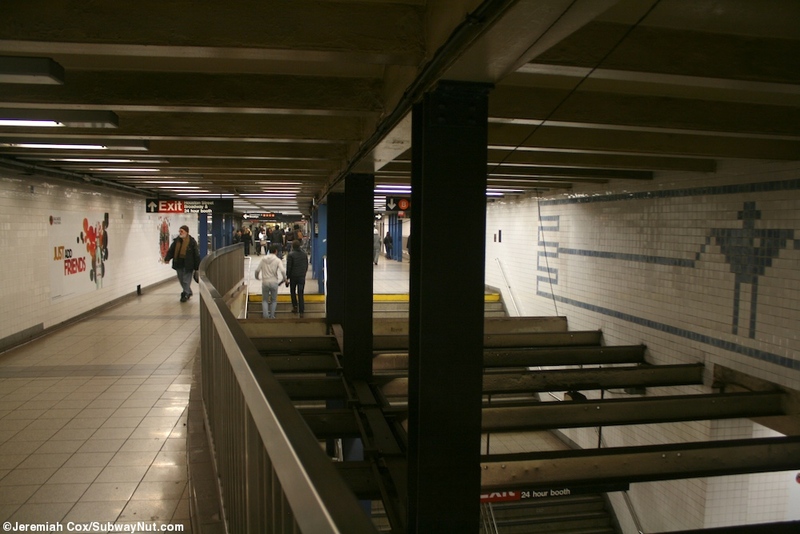 The upper mezzanine level becomes half the width of the cavern giving the lower mezzanine a double ceiling. 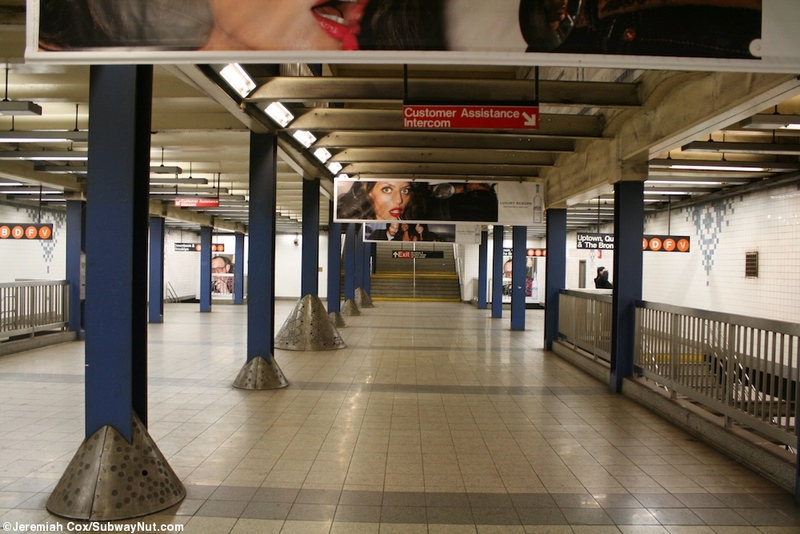 The lower mezzanine has four staircase down to each of the platforms before it ends with another wide staircase back to the upper mezzanine, at this point the upper mezzanine becomes full width of the mezzanine level and there is another two story staircase down to each of the platforms (we are now at their railway southern ends). 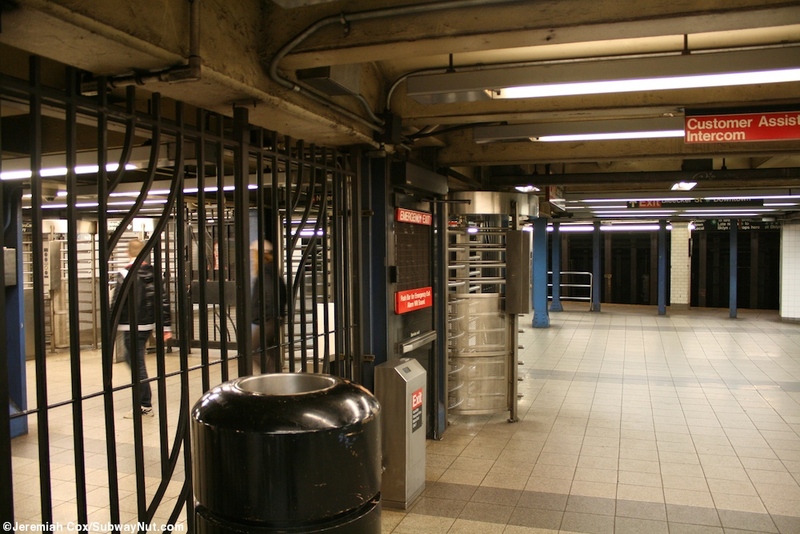 The upper mezzanine continues with two separate secondary exits high turnstiles: two street stairs lead out to the SW corner, and one to the NW corner of Lafayette Street and Houston Street. 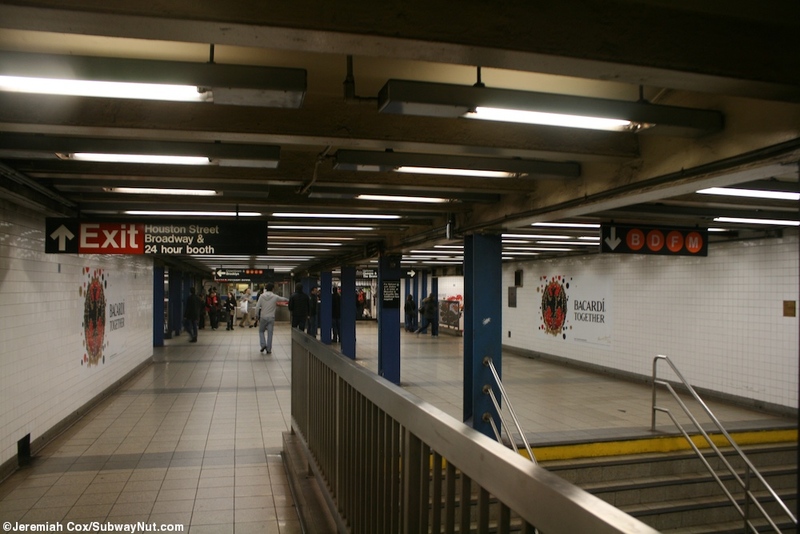 The passageway continues at reaches the southern end of the narrow (and even narrower now because of construction) downtown 6 platform at Bleecker Street. 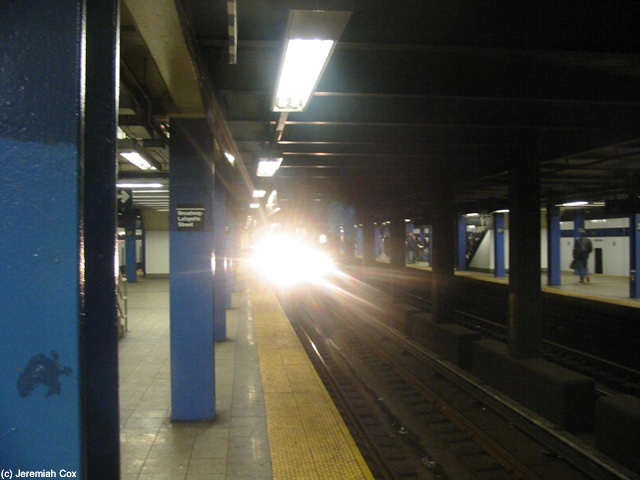 Arts For Transit is still to come, there was nothing in my archive I liked!